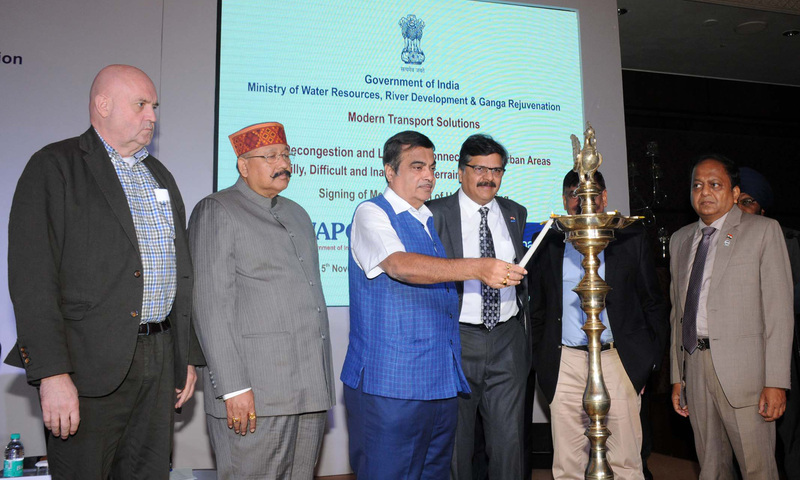 The Union Minister for Road Transport & Highways, Shipping and Water Resources, River Development & Ganga Rejuvenation, Shri Nitin Gadkari lighting the lamp at the signing ceremony of an MoU between WAPCOs and M/s Doppelmayr, Austria for Modern Transport Solutions for Decongestion and Last Mile Connectivity in Urban Areas and Hilly, Difficult & Inaccessible Terrains, in New Delhi on November 05, 2018. Union Minister of State for Road Transport & Highways, Shipping and Chemical & Fertilizers, Shri Mansukh Mandaviya has expressed confidence over the successful implementation of theBhoomiRashi Portal in Land Acquisition process for roads and highways sector in the country. Speaking in New Delhi today Shri Mandaviya said that digitalization in India is reaching new heights under the able leadership of Prime Minister Shri Narendra Modi, and the Bhoomi-Rashi portal of Ministry of Road Transport & Highways is an excellent testimony to this success. The portal allows for totally digital and paper-less processing of land acquisition cases, and has resulted in transparent, quick, corruption-free and error-free handling of land acquisition cases.It has alsomade the possible real-time tracking of activities and generation of reports relating to land acquisition. Shri Mandaviyainformed that revenue records of about 7 lakh villages across the country have been integrated in the portal. He said, this digital change has drastically reduced the time taken for issuance of land acquisition notifications from 3-6 months to 1-2 weeks. The Minister informed that while during the past two years, about a thousand land acquisition notifications could be issued every year, over 1700 notifications have already been issued by the Ministry in the first seven months of this financial year. Shri Mandaviya further said that the process has also brought transparency in the system. Earlier the approved compensation amount used to be parked with the CALA (Competent Authority for Land Acquisition) but with BhoomiRashi portal this amount directly transferred into the account of the person concerned, through Public Financial Management System which is an integral part of the portal. In addition to this, the process is also environment friendly since there is no physical movement of files – all work is done digitally. Shri Mandaviya said the BhoomiRashi portal is truly a success story of Digital India.